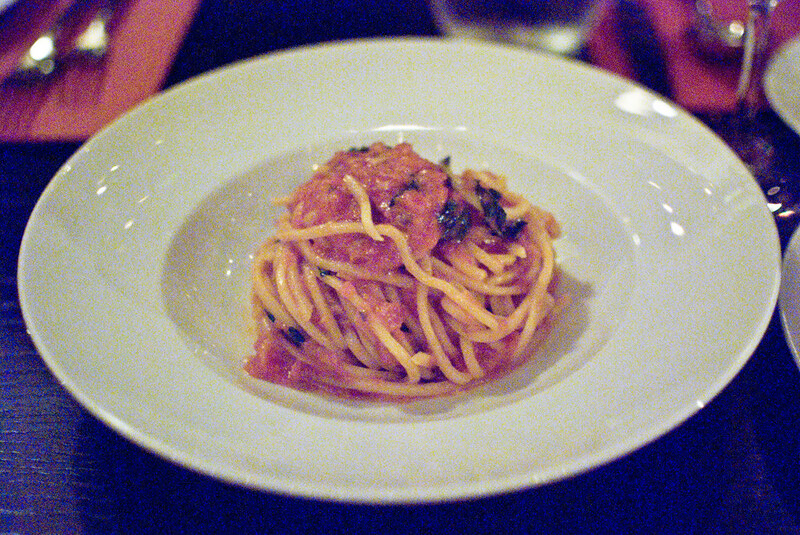 The first time I ever heard about Scarpetta was a mention of its signature dish: a $24 plate of spaghetti. Nothing particularly fancy; there are no truffles, no imported platinum serving dish… Just (allegedly) the best plate of spaghetti with tomato sauce you’ve ever tasted. In thinking about my visit to Scarpetta with my friends Jeff & Eva, I knew I just couldn’t bring myself to actually spend $24 on spaghetti. Then my friend Melissa told me she thought the spaghetti was absolutely worth it — and I still couldn’t imagine ordering it. Then I had what I deemed to be a good idea, “and such ideas are not three a penny.”* My idea was this: we could order the spaghetti as an appetizer, and all partake of this amazing dish for a mere $8 per person. One of the reasons I was excited to go to Scarpetta was that they have an entire menu devoted to vegetarian options. 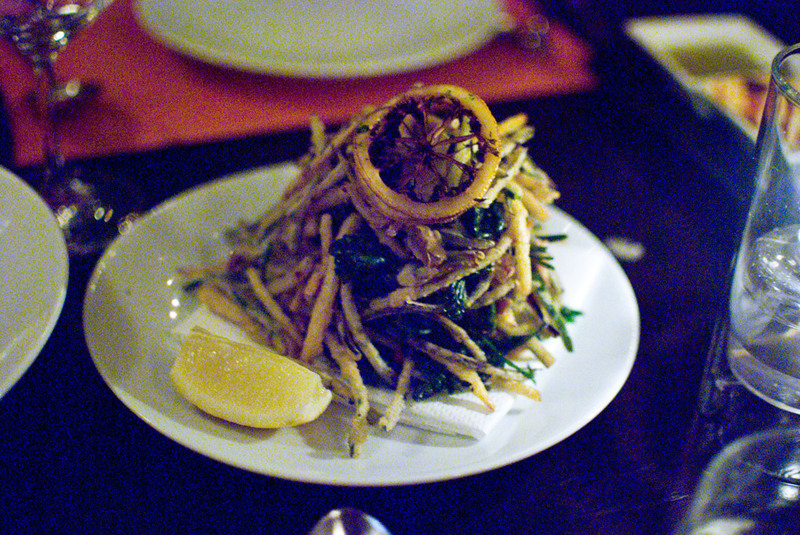 I made the mistake of ordering another appetizer — the crispy artichokes and herbs. The artichokes were cut so thinly that they didn’t have much flavor. They weren’t bad, but they weren’t anything special. I have to stop ordering items on the menu just because they have artichokes listed in the ingredients. Now my entree, that was something special. I got tagliatelle with truffle zabaglione & autumn vegetables — notice that this complicated dish with lots of expensive ingredients was also $24, the same price as that spaghetti (no, I haven’t forgotten about the spaghetti). 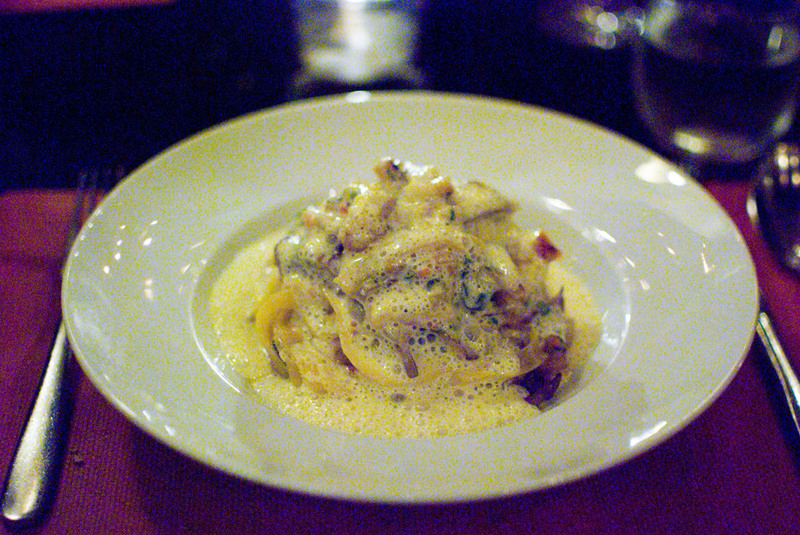 The pasta was perfectly cooked, and studded with sweet chunks of squash and crispy pieces of mushroom. The sauce was poured on top table-side: zabaglione is a rich sauce made with beaten egg yolks. This was just the right amount of richness to balance the truffle and the pasta. So, that spaghetti. Well, it was very good. It’s unquestionably the best plate of spaghetti with tomato sauce I’ve ever eaten in a restaurant. All of the ingredients were perfectly balanced, and the house made spaghetti was wonderful. As Jeff pointed out, the addition of fancy ingredients would have done nothing for the dish, it wasn’t lacking anything. But was it worth $24? Not by a long shot. If it was price about five bucks cheaper this would be a more realistic entree option. Maybe that’s part of the strategy: price it so high that it retains an air of elite mystique. I enjoyed my tagliatelle so much that I’d definitely return to Scarpetta, but I wouldn’t order the spaghetti again, even as an appetizer.